CINCINNATI -- Drivers may want to rethink their next gas pump purchase. 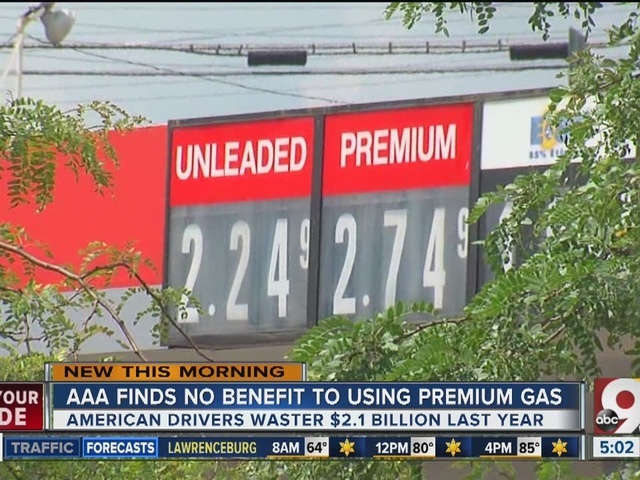 According to new AAA research , American drivers wasted more than $2.1 billion dollars in the last year by using premium-grade gasoline in vehicles designed to run on regular fuel. In the last 12 months, 16.5 million American drivers unnecessarily used premium fuel at least once despite the vehicle manufacturer’s recommendation. AAA conducted a comprehensive fuel evaluation to determine what, if any, benefit the practice offers to consumers. After using industry-standard test protocols designed to evaluate vehicle performance, fuel economy and emissions, AAA found no benefit to using premium gasoline in a vehicle that only requires regular-grade fuel. To understand the magnitude of the issue, AAA surveyed U.S. drivers to understand what type of fuel their vehicles require and the frequency at which they upgrade to premium fuel. Seventy percent of U.S. drivers currently own a vehicle that requires regular gasoline, while only 16 percent drive vehicles that require premium fuel. The remaining 14 percent own a vehicle that requires mid-grade gasoline (10 percent) or uses an alternative energy source (4 percent). In partnership with the Automobile Club of Southern California’s Automotive Research Center, AAA tested 87-octane (regular) and 93-octane (premium) gasoline in vehicles equipped with a V-8, V-6 or I4 engine designed to operate on regular-grade fuel. To evaluate the effects of using a higher-octane fuel when it’s not required by the manufacturer, each vehicle was tested on a dynamometer, which is essentially a treadmill for cars that is designed to measure horsepower, fuel economy and tailpipe emissions when using both fuel types and variety of driving conditions. The testing found no significant increases in any tested category, indicating the practice of using premium gasoline when it’s not required for the vehicle offers no advantage. “Premium gasoline is specifically formulated to be compatible with specific types of engine designs and most vehicles cannot take advantage of the higher octane rating,” said Megan McKernan, manager of the Automobile Club of Southern California’s Automotive Research Center. Follow the vehicle owner’s manual to determine which type of gasoline is required for your vehicle. For optimal performance, AAA urges vehicle owners to keep their vehicle’s maintenance up-to-date by following the manufacturer’s recommended schedule. Drivers whose vehicles require regular gasoline and want a higher quality fuel should select a TOP TIER™ gasoline, not a higher octane one. Previous AAA research found that gasoline meeting TOP TIER standards resulted in 19 times fewer engine deposits than non-TOP TIER fuel. To calculate the total annual cost of using premium gasoline when not required by the vehicle manufacturer, AAA conducted a comprehensive analysis that included a U.S. consumer survey, Federal Highway Administration data, per-gallon costs of premium gasoline and regular gasoline and the average number of fill-ups annually. All testing was conducted at the Automotive Club of Southern California’s Automotive Research Center in Los Angeles, California, using an industry-standard chassis dynamometer, emissions test equipment and Environmental Protection Agency driving cycles. All gasoline used for testing was EPA Tier III certification fuel with ten percent ethanol content in both regular and premium grades. Certified test fuel was used to remove variability in fuel quality and additives. For this study, AAA did not evaluate the effects of using regular fuel in an engine that requires premium gasoline. For additional information about premium fuel, including the full test report and fact sheet, visit the website here .